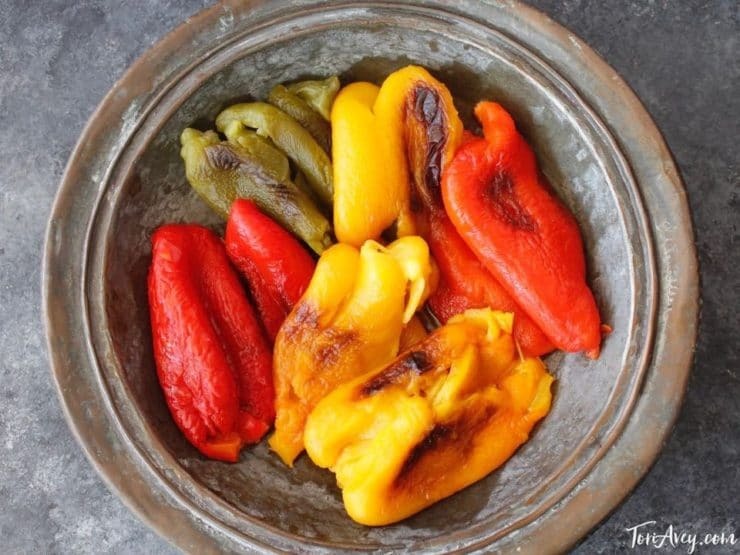 Roasted bell peppers are one of my favorite healthy snacks. 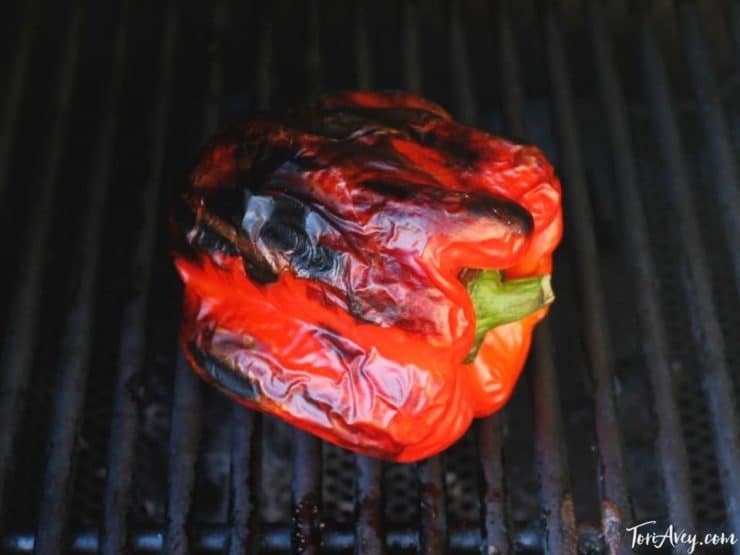 In this post, I’ve outlined four easy methods for roasting bell peppers with a step-by-step photo tutorial, as well as an instructional video. These methods can actually be used for any pepper, but the amount of roasting time will vary based on the size of the pepper. 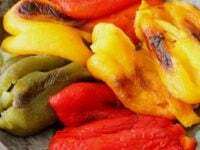 How to Roast Bell Peppers – Easy methods for cooking and charring bell peppers for a rich smoky flavor, from stovetop to oven to grill. Recipe & step-by-step video below! Nutritional information is for 6 bell peppers – values and cook times will vary based on how many peppers are prepared and what cooking method is used. 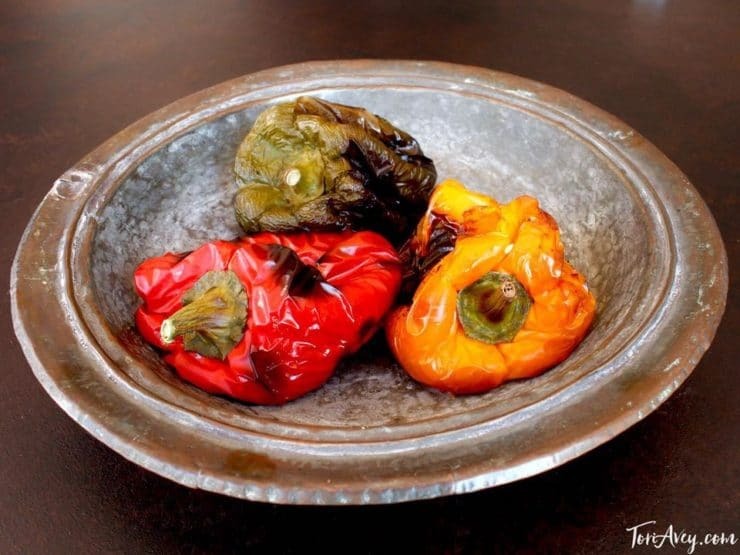 Four easy methods for roasting bell peppers with a step-by-step photo tutorial and instructional video. This is my preferred method for roasting peppers, because you can roast several peppers at once. Preheat oven to 400 degrees. Brush a baking sheet lightly with olive oil. Lay peppers on their sides, stems pointing sideways. 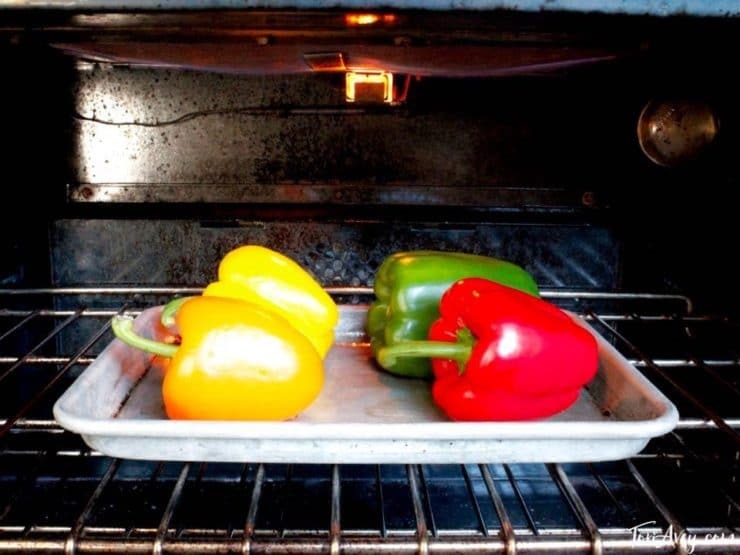 Put baking sheet in oven and allow peppers to roast for 20 minutes. Remove baking sheet. Using tongs, give the peppers a half turn, then place back in the oven for another 20 minutes. Check to make sure peppers have fully roasted. The skin should be charred and soft, and the peppers should look slightly collapsed. If they don't look ready, let them roast for a few more minutes. When they're done, remove baking sheet from oven. 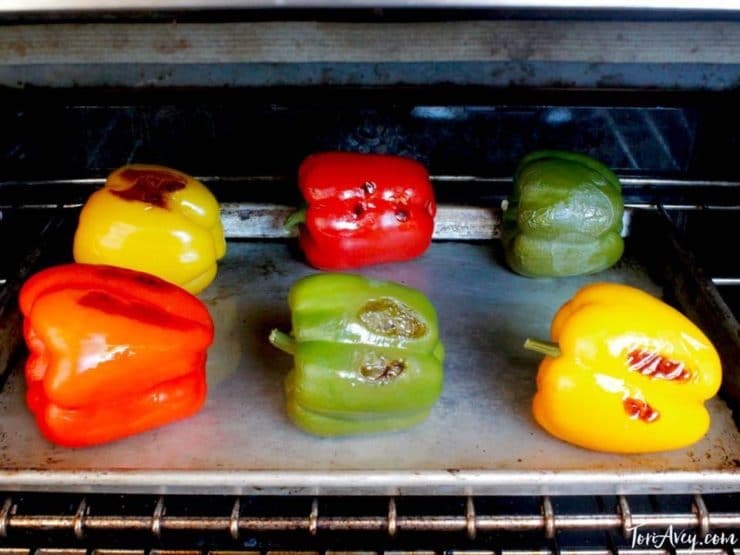 You can also use your oven broiler to roast the peppers, which is a faster process that chars them more than regular oven roasting. While it goes faster, you also have to watch it carefully, as the peppers will need frequent turning during the process. If you wish to broil the peppers, I suggest placing the rack in the upper third of the oven so there is 8-9 inches between the broiling element and the peppers. That way, the peppers will be able to soften as they char. When they're too close to the broiler, they will char before they're cooked, which means the flesh won't soften and they'll be harder to peel. Preheat broiler to high and place the peppers below the broiler. Let them roast for 20-25 minutes, giving a quarter-turn every 5 minutes, until the peppers are charred, soft and collapsing. The broiler will char them quite a bit, the skin will be very black and crispy-- don't worry, you're going to peel it off anyway. Remove from the oven. Proceed to instructions for "Steaming Your Peppers." 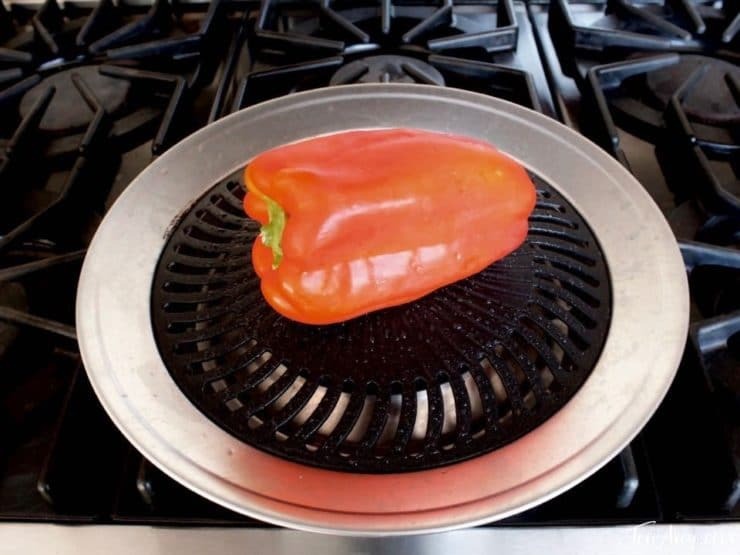 I typically use this method when I only have one or two peppers to roast. It's messier than the oven method, but it produces a very smoky rich flavor. 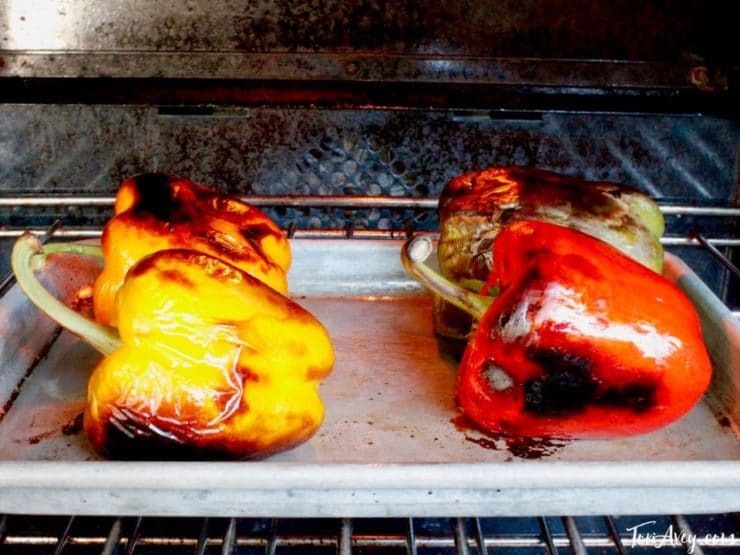 There are a couple of ways to roast peppers on the stovetop - on a gas flame, or on a grill pan. If roasting directly on a gas stovetop, you may wish to cover parts of your heating element with foil to protect it from spills. Turn your gas stovetop flame to medium. 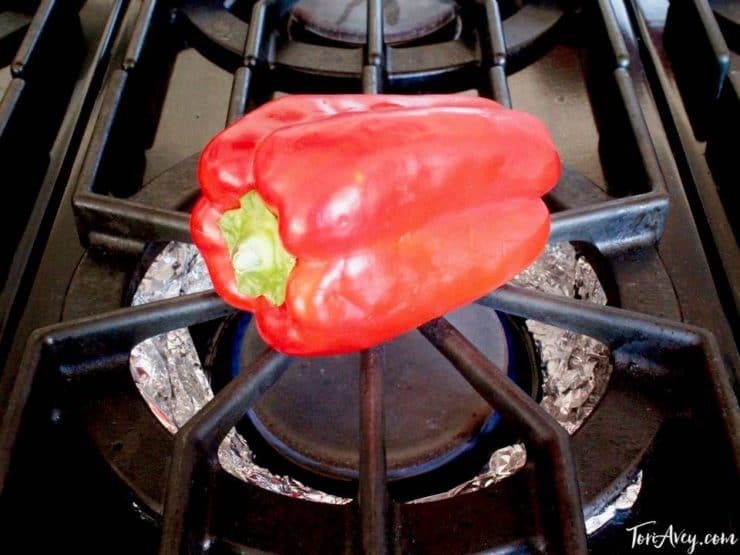 Place pepper on the grate directly over the top of the gas flame. Let it roast for 20-25 minutes. Use a pair of tongs to give the pepper a quarter turn every 4-5 minutes. After 20 minutes, use tongs to gently squeeze the pepper. If the pepper is soft and easily yields to the tongs, it is ready. If the pepper still feels somewhat firm, let it continue to roast for a few more minutes until it softens. Remove pepper from the stovetop. Proceed to instructions for "Steaming your Peppers." Prepare grill pan according to instructions. My pan requires a bit of water to be placed in the circular chamber. Preheat grill pan over medium heat; brush lightly with oil if it is recommended for your pan. Place pepper on the preheated pan. Roast the pepper for 20-30 minutes, giving a quarter turn with a pair of tongs every 5 minutes or so, until the pepper is charred and collapsing. Check water level about halfway through cooking if your grill pan requires it. Skip to instructions for "Steaming Your Peppers." I tend to use this method during the summer when we're using our gas grill a lot. Roasting over an open flame produces a great smoky flavor. Be sure to wear a protective oven mitt. 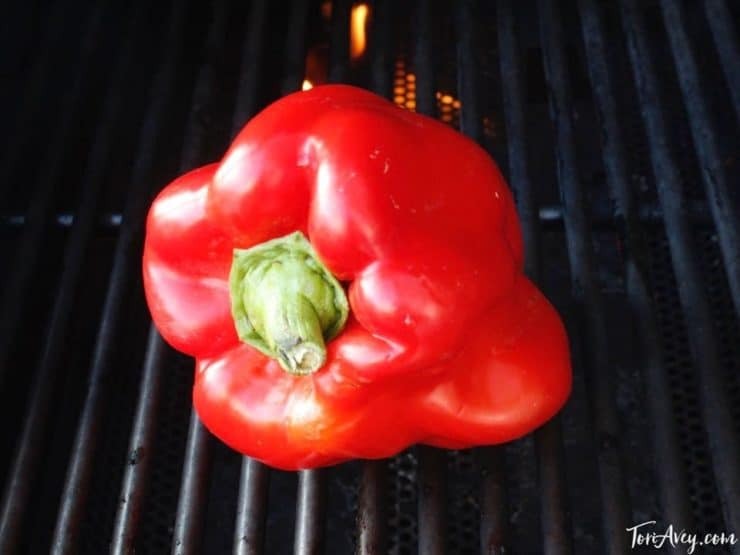 Place peppers on the open grill over a medium flame. Let them roast for 15-20 minutes, using tongs to give them a quarter turn every few minutes, until the peppers are charred, soft and collapsing. 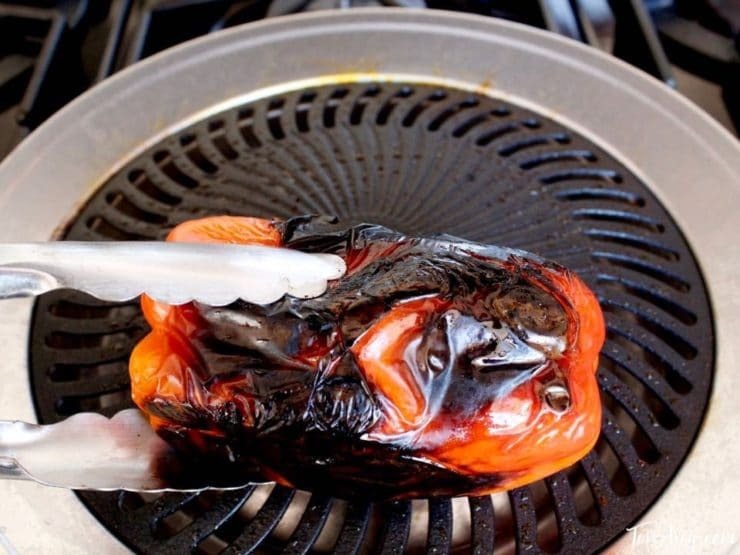 You can also use a kitchen/bruleé torch to char your peppers, but it's a slow process. Using a grill or gas flame is more efficient. 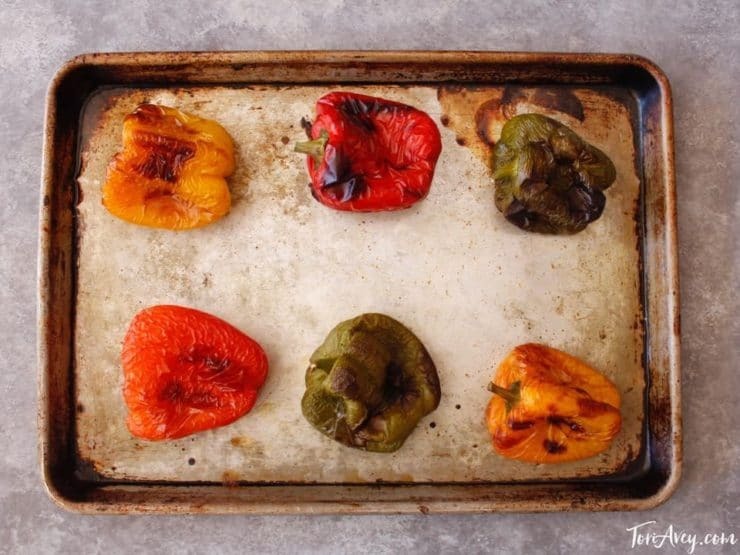 Once you have roasted your peppers, you will need to steam them. This process will help you peel the tough skin from them more easily. There are a few ways to steam the peppers. I like to place the roasted peppers on a flat, smooth surface like a cutting board, then invert a large bowl over the top of them. 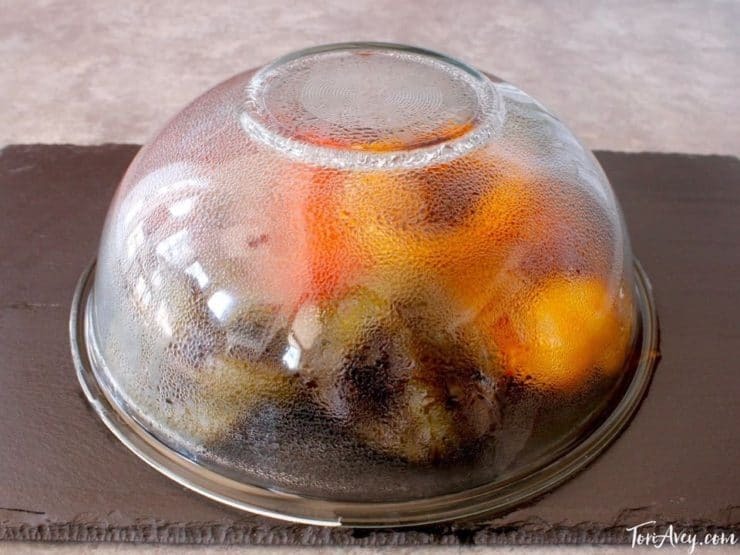 The bowl traps the steam inside. Steam for 15 minutes. Alternatively, you can place the peppers in a paper bag and seal the top by rolling it closed. I prefer using the bowl method. Whichever method you choose, steam the peppers for about 15 minutes. 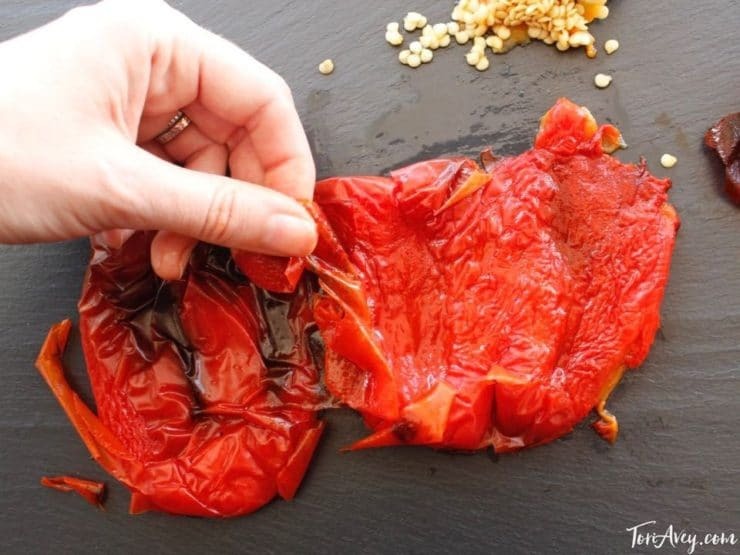 Once you have roasted your peppers, you will need to seed and peel them. This is kind of a messy process, but it's well worth the effort. Note that some people like to seed their peppers before roasting. When I have tried this in the past, the results are never as good as when I keep the whole pepper intact during roasting-- I recommend roasting the peppers whole and seeding after the roast. Slice the pepper vertically from top to bottom and lay the pepper open so it becomes one long strip. Pull the stem from the top of the pepper. The stem and a clump of seeds should loosen easily. 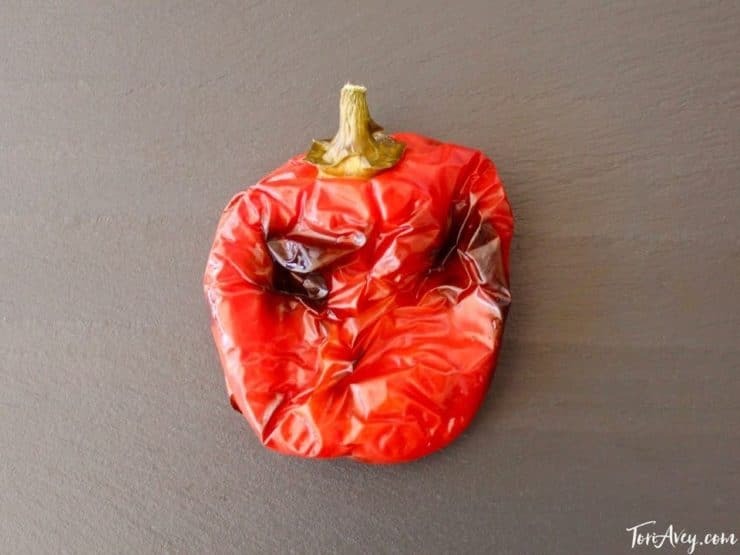 Use a towel or paper towel to wipe off any loose seeds that remain inside the pepper. Flip the pepper over to reveal the skin side. Strip off the charred skin. If you want a more charred flavor, you can leave a few small blackened bits on the skin. Alternatively, you can seed and skin the pepper under running water, which will make it easier to get the pepper flesh clean. I prefer not to do this, because I feel the pepper loses some flavor in the process-- but if you're in a hurry and don't want to mess up your hands too much, it will speed things up. Once you've peeled and seeded your peppers, you'll end up with soft, sweet, tasty pepper flesh. If you want to store the peppers short term, put them in a sterile glass jar and cover them with olive oil. Cap the jar tightly and refrigerate. If you don't plan on using them within a few days, pressure can them: https://toriavey.com/toris-kitchen/2013/09/pressure-canning/ or freeze the roasted pepper strips in Ziploc bags... they actually hold up well to freezing and retain much of their flavor when thawed. Roasted peppers can be used in a variety of recipes, or snacked on as-is dressed with salt and pepper. They can be added to stews and pasta sauces or chopped into salsa. They can even be mixed with fresh basil and olive oil to create a peppery bruschetta. 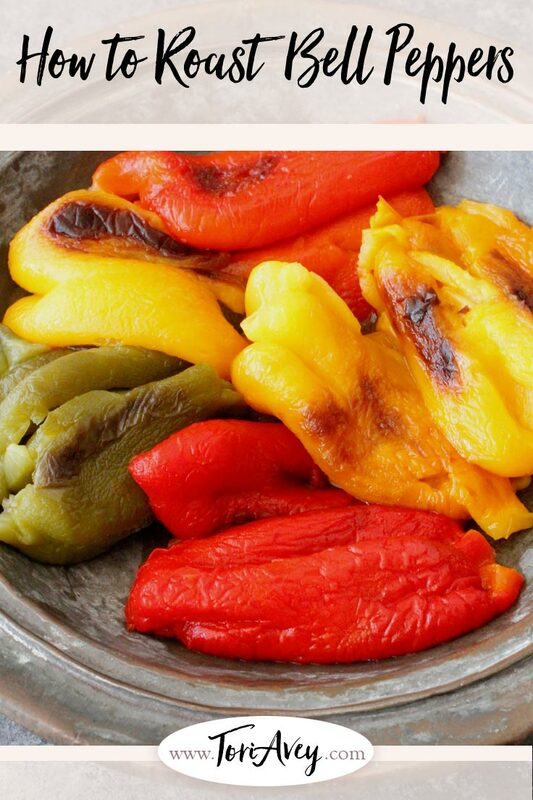 I have many recipe ideas on my website, just search Roasted Bell Peppers for ideas. Enjoy! Wow, thanks so much for the explicit details and photos about each method. For some reason, roasting bell peppers always seemed so daunting. I think it was that I always read that you need a paper bag, and I rarely have one around. But after reading your info, it was not difficult at all and I used your bowl over the pepper method for steaming. I used the oven roasting method and my peppers turned out perfectly. Do you have to remove the skin?if so, why? No, it just makes for a nicer texture overall. Tried recipe today. Directions were simple. Peppers came out great! Thanks a million. Do you cover the peppers in any oil before roasted? There is no need for any oil, Donna. I went to a produce distribution in my community yesterday and one of the items being handed out was bell peppers in 3 colors. I was armed with about 8 lbs of peppers and no idea how two old people could eat them all before they went bad. A quick internet search led me here to this recipe. It worked like a charm. I followed each step exactly as described and the results were perfect. What I couldn’t believe was the ease in removing the skins! I loved learning about the steaming step, something I have never even thought of before nor read anywhere else. Seems like the steaming also caused the seeds to pop right out. Thank you very, very much for taking time to post this recipe. I shared the link on facebook. Yes! I agree! Have seen many recipes/methods, but never the ‘steaming’ one. I’ll keep doing this with mine! Roasted red peppers go great in a wrap with sliced cukes, carrots, lettuce, avocado and garlic hummus as well! Healthy and tasty!! Take it from a kidney transplant/diabetic patient ?? If you want the peppers to stay firm (uncooked) give this a try. I just did and it works great. If you have a hand held propane, butane or map gas torch this is what you do. I took a large red bell pepper from the fridge. and put it in the sink an a metal rack. I lit the torch and put the blue flame directly on the pepper the nozzle about an inch away. You will get the feel for the right distance as soon as you start. Slowly move the flame in a straight line back and forth. Go slow enough to let the skin turn totally black as you go. It will char about 1/2 inch per stroke (just a few seconds). Progress going around the pepper by turning with a pair of tongs. Stand the pepper up and do the ends. Then put it under running water and rub it with a green scotch pad or scrape it with a sharp knife. The skin comes off very easy and the pepper is just as firm and raw as it came out of the fridge. COOL!!! CAUTION: If you do not know how to use a torch, have someone show you how. You can easily be burned if not careful. P.S. These torches are cheap and can be found at any hardware store. P.P.S. A high temp. heat gun works just as well but cooks the pepper a bit. Easy and clear instructions, although I suspect they are best for the large bell peppers indicated. I was hoping to have better luck with piquillo peppers (a pimento-sized pepper) using the oven method here than I have had with other techniques, but the results were similar. Although I reduced the time a bit to account for the smaller size of the piquillos, they still cooked too thin, which made separating the skin from what was left of the wall of the peppers almost impossible without tearing them apart completely. That said, the steaming step here, with the bowl, is definitely better than the bag method I’ve used in the past. 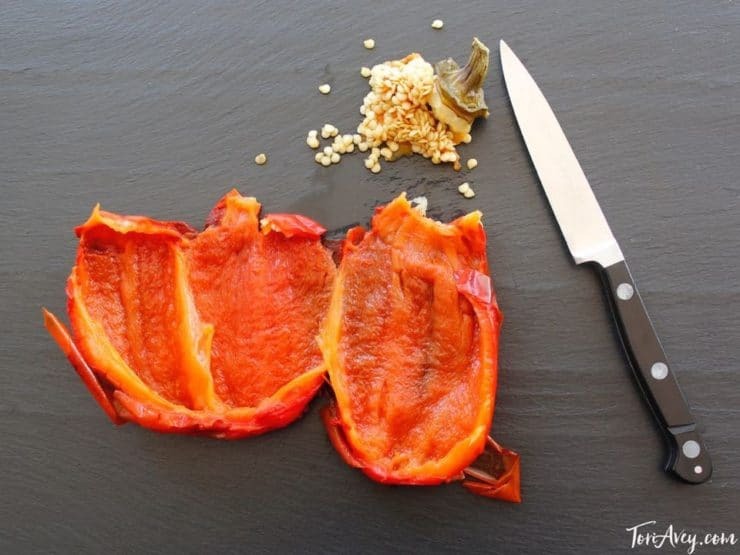 I would really like to find instructions on how to peel piquillo peppers, specifically, without roasting them to bits or tearing them apart, as I have lots of recipes that call for stuffing them. Thank you for providing a great and clear technique for large peppers, though! Hi Kathy, Tori’s assistant Ashley here! 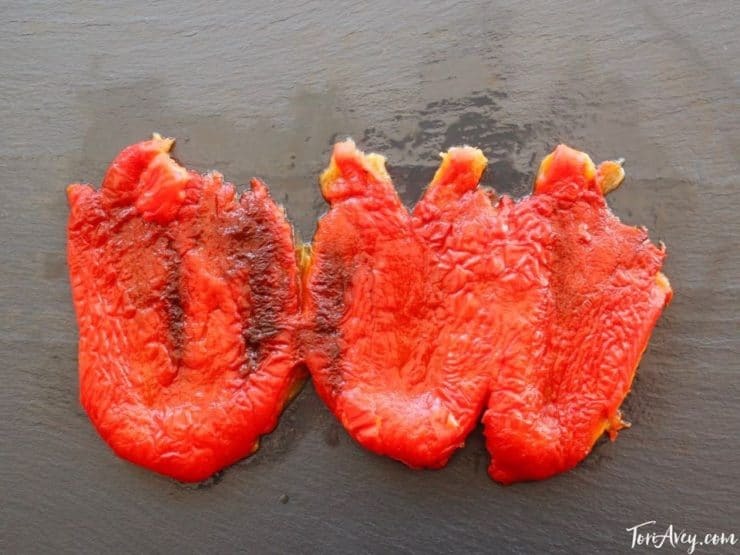 I would not suggest freezing roasted peppers, as they probably won’t have a nice texture when they thaw. I’ve roasted my peppers in the late summer and freeze them for Christmas. You must let them thaw slowly. They retain there freshness and the peppers say firm! Enjoy! I agree with Bill about the thawing. Vegetables I have frozen myself (either cooked or raw) tend to be more like what they were before freezing if you defrost them in the fridge for 24 hours, or if time is a necessity, on the kitchen counter for a few hours (Put them in a bowl or plate before thawing, because the juice that will come from the peppers as they thaw can quickly stain clothes, countertops, floors, etc.) I wouldn’t force the thaw by immersing the peppers in hot water, microwaving them, or by heating them in the oven or stovetop. If you want the peppers hot, heat them in the oven *after* you defrosted them. A full, slow defrost will insure that the peppers are somewhat firm. Of course, if you are dropping them into a blender for a sauce or soup, by all means, defrost any way you choose. The consistency will not matter if the pieces will not be used whole. Great recipe, by the way! I had dome similar things in the past, but knowing I don’t have to oil the peppers meant a lot of difference in the outcome of the peppers. Adding oil to roast them makes the charring take a little longer, and it also adds liquid to the pepper, making the pepper a bit mushy – not great if you want the roasted peppers as an antipasto, where it needs to have shape and be strong enough to pick up by fingers or fork. I was filled with trepidation, never having done this before, but your description was perfect, and the photos enhanced your words. I actually had fun doing this and am definitely saving your posting! Thank you so much!! Haven’t tried the recipe yet, but definitely think I will try soon. Wanted to thank Ms. Avey for her concise but detailed descriptions of the different methods, the great pictures and excellent pros and cons of each method. Don’t need to do much more research on this subject, you covered it better than anyone else I’ve seen. I got more out this then from the Food Network. Someone should really give you the opportunity to write a cookbook! Thank you! The oven method and the upturned bowl worked beautifully. I actually used the technique for pimentos, although they weren’t a lot smaller than large bell peppers. Forty minutes may have been too long because the pimentos were a little softer than intended. I’ll keep a closer eye on them next time and reduce the time. The pimentos have gone into pimento cheese, with Duke’s mayo and a pound of Tillamook extra sharp cheese. Two thumbs up for your instructions. Thank you so much!!! The oven method with steaming was so easy and the skins slipped off like a dream. I’m on a low carb diet and when I make fajitas for the family I just eat a big bowl of roast peppers, onions, and fajita meat . . . yum . . . hardly miss the tortillas. Great directions – easy to follow, delicious. Thanks. Thank you for a detailed step by step of an easy enough recipe. The pictures and tips are what makes this post stand above. 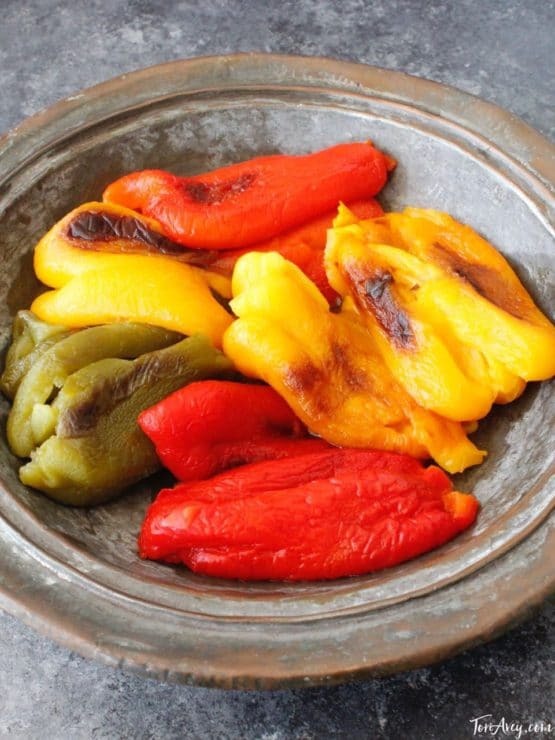 I have just roasted the peppers to use in your matbucha recipe.Thanks for your post! Tori – this is STILL a fabulous how-to and thread. Roasted my red peppers just as you said – which everyone says to do – but the STEAMING part I’ve not seen. Utterly brilliant and left me with luscious, soft, easy to peel, seed and cut peppers, that I just put in my virtually calorie-free version of a snack: Fresh Roasted Peppers and Cucumber with Fruit Vinegar. Recipe for this is: Two fresh-roasted, peeled and seeded peppers (red, yellow or orange) cut into small pieces, one peeled (or not if you don’t want to) and two cucumbers, sliced into sections. Put in a coverable container and add a PULPY FRUIT VINEGAR – currently I’m using A L’Olivier Passion Fruit Vinegar, and toss. Thank you for your great instructions! I just roasted a beautiful orange pepper. I’m going to cut it up and mix it in my pimento cheese for my sandwich for this week. Thank you Tori! Hi Tori, I use roasted bell peppers exclusively in my Southern pimento cheese recipe…much, much better flavor than store-bought jarred pimentos. explanations were perfect. i had always stayed away and then i said i would try. no regrets. totally easy. thanks a million. For the oven method, are the degrees celcius or farenheit? Thanks Tori, the roasted peppers recipe looks great. One question – I am very allergic to olives, can I use coconut oil or butter? I am not a fan of corn or soybean oils. Thanks again ❤. I look forward to reading your reply. Hi Sharon– yes! I’d use coconut or grapeseed oil due to the higher smoke point. Enjoy! 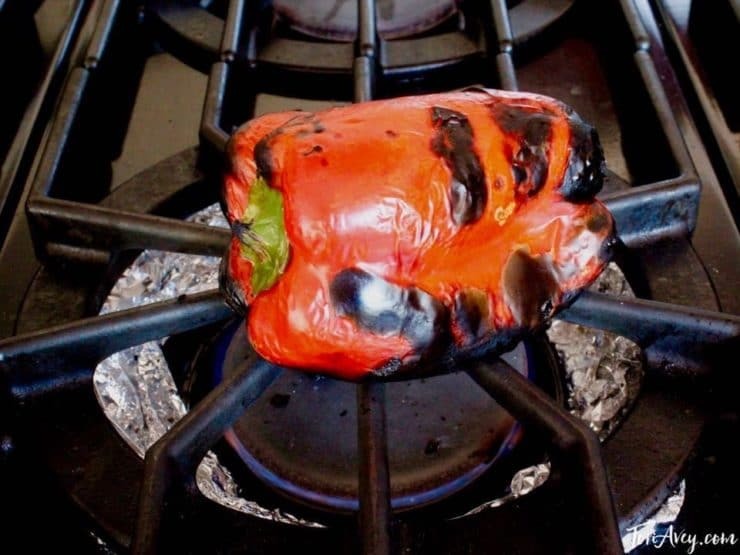 Thank you for providing this clear and detailed method for roasting peppers. I have tried various techniques with mixed results, but the oven method worked perfectly. To steam the peppers, I slipped the aluminum foil they were cooked on onto the stove top and put an inverted glass casserole dish on top. It worked great! Tried the oven, followed the instructions but I like the peppers a bit crunchy. All I got here was a load of over cooked soggy peppers. I’ll stick with doing them fast on a hot grill. These aren’t supposed to be crunchy. That’s the whole point of this method. They become “pimentos” which is what olives are stuffed with. They also blend beautifully into a creamy sauce or soup which you can’t do if they are crunchy. If you want crunchy, don’t cook them. This is an excellent set of instructions for ROASTING bell peppers. If anyone is confused about the expected consistency of the finished product, check jars of roasted bell peppers in the store or in restaurants. As Lindqa says, “crunchy” is not an appropriate adjective for roasted peppers. What Don is describing is a different process, it’s used for removing skin and adding charred flavor to uncooked or soon-to-be cooked peppers. Most Chile Rellanos recipes include this charring process as the first step and the cooking process later. In NM they char the skins off full bags of peppers all at once just to save buyers time/effort skinning them for a variety of recipes. This is not the same as roasted peppers (as it is commonly known). Thus, Dan’s rating is not appropriate for these instructions. These steps always produce perfect roasted bells for me–and, obviously, many others. I just ate the result of the over-roasted peppers and it was perfect! After steaming, I poured the “steam” in the peppers into what would become my green chili sauce, and it was so awesome. Thanks for the easy to follow recipe! Hi I just did this with poblano peppers. They came out kind of mushy so I might try 30 min total and keep roasting for additional 5 till its where I like them.Thank you so much, I will definitly try with bell peppers. 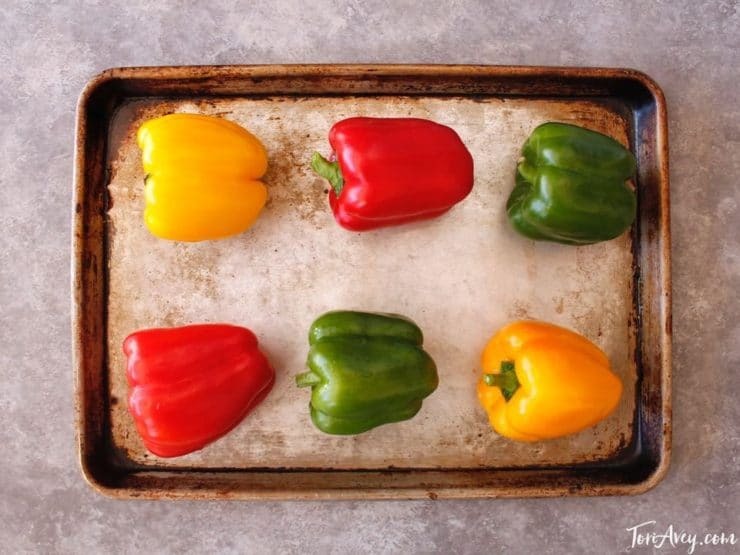 try rubbing or brushing the peppers with olive oil before oven roasting. the skins come off easy and in large pieces.I never have to steam them to get off the skins…. I don’t have the equipment or facilities for canning but want to put a large amount away as I use store-bought roasted peppers quite often in cooking and daily salads. I am always leary of store-bought as to the preservatives and sugars added for shelf life. Could I use sealable plastic containers with olive oil, vinegar and spices and freeze them and then take out to refigerate as I need them, say for a week’s worth of salad toppers? Any other ideas you might have in this regard would be most appreciated. Hi Rick, freezing roasted peppers is a good way to extend their shelf life as long as you are using an airtight container. What I would do is roast, peel and seed them, then place them on a parchment-lined baking sheet and freeze. Once they are frozen, put the frozen peppers into an airtight container or zipper bag. For the sake of flavor and texture, freeze them on their own without oil or seasonings, then defrost as needed and add the oil/seasonings to each defrosted batch. Hope that helps! Why do you remove the skin? Is the skin not good for you? Nikki, the skin has a stringy texture… the peppers have a nicer mouth feel without. It won’t harm you though. 2) Add EVOO to just cover the pepper strips. 3) Add fresh garlic and loosely chopped basil. Excellent sandwich: We often serve the roasted peppers with goat cheese added to thinly sliced flank steak in a section of a baguette. Makes a phenomenal sandwich. Thank you Tori for a great recipe, and easy to follow explanations. I happened to have 3 bell peppers that I had partially used for another recipe, so I had cut the bottom off of them. Rather than laying them on their side as you recommend, I found it easier to stand them up since the flat cut bottoms made it possible. I roasted them for a straight 40 minutes at 400 degrees without turning them, and they came out perfectly ready for steaming and peeling. Looking forward to having them at dinner tomorrow night! Thanks again. You are soooooooo hot, pepper recipe not too bad either. So glad to have found this site. Thanks for your information. I have roasted several peppers now on my outdoor grill to add to hummus. I am in Arizona and it is still a little too warm to use my stove top or oven. I have found that after I slice the pepper vertically I can use the back of my knife to scrape the seeds off. Works great. Hi, I was wondering if water can be used fir storing in the refrigerator instead of oil? Hi Susie, I do not recommend storing them in water. If you don’t want to cover them with oil, I recommend freezing them instead. Thank you for sharing this, it was incredibly easy to follow and I used the roasted peppers for my hummus! Great Crystal! Happy it was helpful. I slow sauteed them in a frying pan on the stove top after stemming and seeding them. Added olive oil and fresh basil and let them steam. Delicious. Did not peel. They were great. Thanks, tori. I plsced a small grate on the coils and roasted 4 jalapenos. It took about 25 minutes and turned out good enough. Hello, would electric coils work? Hi Joylan, I’m not sure because I haven’t tested it. I think they should work, but I can’t promise anything. The contact between coils and aluminum foil may make the foil too hot and cause it to burn, so if you decide to try it be sure to monitor the heat carefully and turn down the heat if you feel the foil is turning red and/or burning. You may alternatively use the oven method, which might be a safer bet. Your instructions, along with the photo’s was so easy to follow. My roasted peppers turn out great! This is my new favorite website. Been roasting green bell peppers for years, as my mother did as far back as I can remember. Cut the peppers in half lengthwise, the best cut which allows them to retain a shape, and remove the stem, seeds and pulp BEFORE you proceed. Roast in a foil-lined pan with some olive oil at 375-400F degrees, turning them over once, until desired tenderness is reached. There is no need to char the peppers and, therefore, no need to peel them. Thank you. Thanks for the wonderfully helpful, informative, & just-the-right amount of cooking advice. I am hopping into the kitchen right now to try out the steps you recommend. Great job! This is my first time roasting peppers, and they came out perfectly! The skins slipped right off the peppers after steaming, and I just pushed the seeds to the side with a table knife. It was so easy. And the house smells great too. 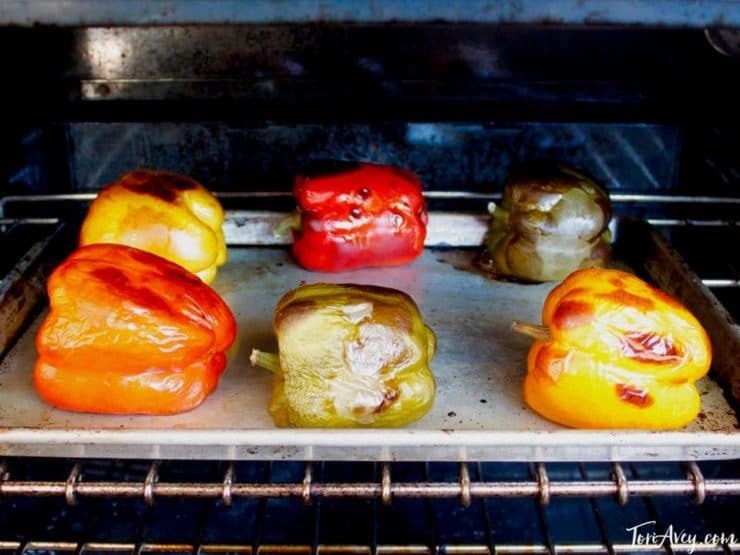 I’ve always thought that roasting peppers would be a daunting task, but you’ve made it so simple. I can’t wait to make my next batch. Thank you from a roasted pepper fan in Miami Beach. Great to hear that Mark! We roast them on the regular here at home. They do make the house smell great! Thanks for this recipe! I had some bell peppers that were too far past their prime for eating raw, but not so bad that they needed to be tossed on the compost pile. I roasted them and plan on throwing them on some focaccia tomorrow, along with some spinach, feta, and marinated artichoke hearts. Hi Zigmund, absolutely, vegetable oil will work find here. So would the leftover storage oil for the peppers. Enjoy! My husband brought home bell peppers from our Farmer’s Market in Olympia, Washington because he was craving spaghetti. I found your site and we watched it together, our peppers are happily roasting as I type. Thank you, Tori , We are your newest fans. Can you roast on a glass top stove. Hi Toby– no, I don’t recommend it because the heat element will be too close to the foil, resulting in burning. I recommend using the oven method instead. excellent info re: roasting peppers! Thank-you! This was an excellent explanation for roasting bell peppers! Very informative and close attention to details. I especially liked the pictures and recipes. Thanks for your help! Like someone already said, your instructions are amazing! Just when I am thinking of a question to ask you as I was reading some of the methods, there was my answer in the following sentence. I read a different recipe just before reading yours. A recipe from one of the food network “goddesses” and it was nothing like yours as far as step by step and the thoughtful detail you showed. Thank you very much! I will be making roasted peppers myself from now on instead of buying jarred. Fantastic, great instructions and pictures. Added just a bit of kosher salt. These are great with grilled chicken, pepper jack cheese, and chipotle mayo in a tortilla roll up. Thanks for the detailed instructions! I had a ton of peppers that would have certainly gone to waste, but now they’re all roasted and soaking in some olive oil. The oven method was very, very easy and only a little bit messy when I was removing the stems and skins. The house smells amazing now!! Reminds me of my Mom’s method–great tutorial! If I have a lot of peppers to do, I’ll put on the BBQ to roast them, it saves the mess in the house and also if its a warm day it keeps the kitchen cool.. I peel them and put them in a jar with olive oil and garlic cloves, if I don’t use them right away I put them in the freezer in a mason jar yummy. I commend you for the colorful pictures that coincide with your easy instructions! That is exactly the best method for me to try something new. So, the peppers from our garden are lined up on the counter and I’m ready for a new adventure ~ ROASTING PEPPERS!!! (yum-yum) Thanks for your help! My favorite way to use roasted peppers is in a sandwich with sharp ceddar cheese. Plain easy and delicious. Just used your oven method to roast the abundance of peppers we received from our CSA. It worked very very well. Thanks for posting! Thanks for the tips-this was very helpful and the beautiful pictures are definately a plus!! I steamed the peppers in a bowl with a glass plate over it. After the 15 minutes, I sliced the peppers on the plate, placed the slices in the bowl and threw away the seeds. Less dishes and clean up! i have an even better way that saves you the tossing and turning the peppers every few minutes. i cut them in half, remove seeds and stems BEFORE i put them in the oven. about half way through roasting, i batch the halves a little, to make sure all sides are well grilled. from here on, it’s a piece pf cake….when i’m really lazy, i just grab all four corners of the paper sheet, turn it upside down and “tuck” it under the pepper, letting it to cool on the baking pan. saves time and dish washing. I have never tried this before.I am making them into christmas presants, hope they will work?? I have to comment about how precise and wonderful your instructions and pictures accompanying your recipes are. It’s like having your own personal teacher standing next to you, guiding you step by step through each process of the recipe; just marvelous. Thank you so much; keep those recipes coming. If you want to go one step further and cook the most awesome side dish ever. In a large heavy pan, heat olive oil ( at least 2 cups or enough to cover the peppers half way – you are not deep frying, but you need enough to enjoy. then and add two bulbs of garlic cloves. Yes – 2 bulbs and don’t slice or cut the garlic cloves. Add them whole. Then remove garlic (so it does not burn) then add peppers. Cook until dark and continue to turn over until almost blackened. Add garlic back and cook until garlic is browned. But not burnt. This is the best way to eat peppers and the oil is so good to dip in bread. The garlic will reduce its flavor so you can just eat the cloves whole. Totally delicious! When my mother did this, she would sprinkle the roasted peppers with salt at the steaming phase – she said this flovoured the peppers and helped with the peeling! Just did the oven method. So easy and actually kind of fun. My house smells so good right now!! I am making Bruschetta with goat cheese and roasted peppers. Thanks so much for the excellent instructions!! I used the oven-roasting method, and it worked really well except for taking a good deal longer to roast the peppers properly. I suggest using peppers all about the same size, and getting small to medium peppers. I need to roast the peppers myself because we have a low-sodium diet, and the ones in the store all have a lot of added salt. Thanks for a great recipe! I just posted a recipe for Pepper Salad that uses peppers either sauteed in olive oil, roasted, or grilled. I use it as a side dish or my favorite is to eat it on a toasted baguette. I like to sautee them and leave the skin on. Thanks for sharing all of this information about preparing peppers. Merci! Oven beats stove top any day when it comes to ease! This is a great tutorial. Tori, you really do have the last word on how to effectively roast peppers. I was a victim of that messy stovetop roasting method…until NOW! Thanks for the oven way!